The first Monte Cristo sandwich I ever had was at Disneyland at the Blue Bayou. The Blue Bayou is the restaurant inside of the Pirates of the Caribbean ride. The sammys there are good- but a traditional Monte Cristo is deep fried and you usually can only make it through about 4 or 5 bites before you feel like you've hit your annual grease limit. This is another take on the same sandwich. 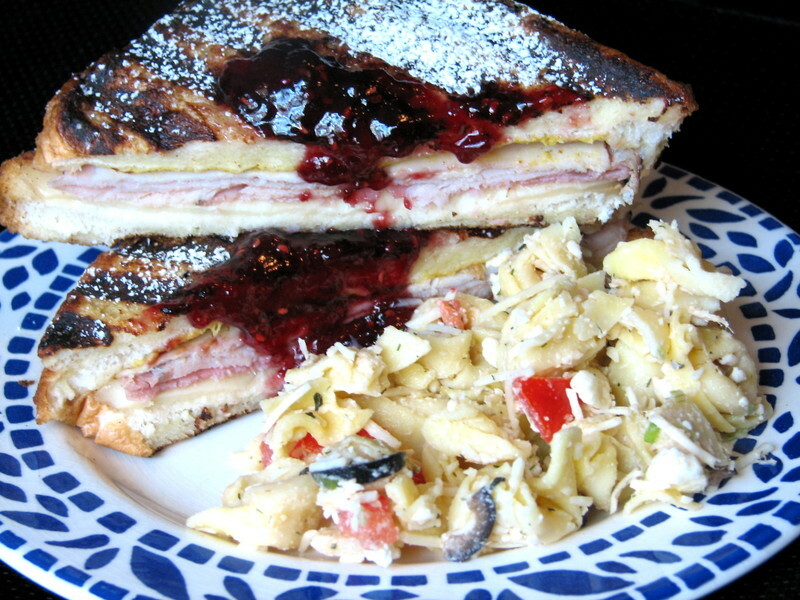 Monte Cristo's are a mix between french toast and a grilled ham & cheese sandwich. Definately falls into the 'comfort food' category. Since we are going to Disneyland tomorrow we thought it was only fitting to pay homage to the 'Cristo's tonight. This was served with a cheese tortellini pasta salad (thanks for the delicious salad Stephenie & Jared!) Hope you enjoy! Combine eggs, milk & spices in a bowl & mix.